After a successful 4-game road trip, in which they went 3-1, the Vancouver Canucks are back at Rogers Arena to take on the Phoenix Coyotes. Both teams played a month ago with the Coyotes winning in the shootout and Antoine Vermette getting the shootout winner. The Coyotes currently occupy the 8th playoff spot in the Western Conference. Thanks to the Edmonton Oilers, their lead on the 9th place Canucks is only a single point. 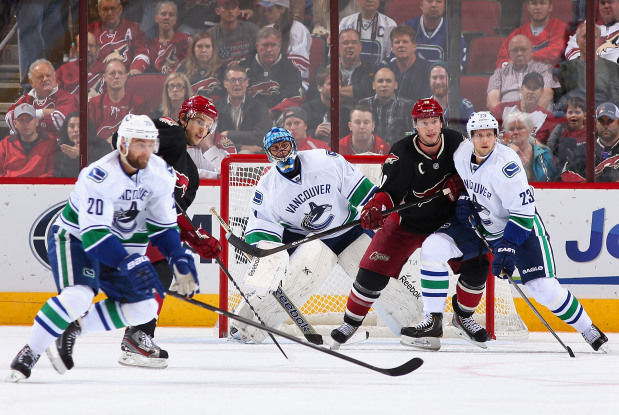 Needless to say, tonight’s game is critical for the Canucks, as a win in regulation would push them back in a playoff position, although the Coyotes do have 2 games in hand. Ryan Kesler is back in beast mode. He has 4 goals in 2 games, and his 14 goals so far this season is good for 8th in the entire league. Defenseman Jason Garrison also seems to have shaken off his scoring slump. He has 4 assists in 2 games, and has recorded 3 multi-point games in his last 4. He now has 17 points this season, which is 14th among all NHL defensemen. For the Coyotes, defenseman Keith Yandle has goals in back-to-back games. Captain Shane Doan, who is second with the team in scoring, has 3 points (1 goal and 2 assists) in his last 2 games. Remember last week when we only had one player on injured reserve? Ah the good ol’ days. Unfortunately our injured reserve count has tripled. The 2 Alexes – Burrows and Edler – join Jordan Schroeder, who is still weeks from returning. Phoenix will be without defenseman Zbynek Michalek (lower body) and forward Lauri Korpikoski (upper body). Previous story CHB Contest: Win Canucks vs. Jets Suite Tickets!